How can myCourses become a tool that empowers students during their academic career? 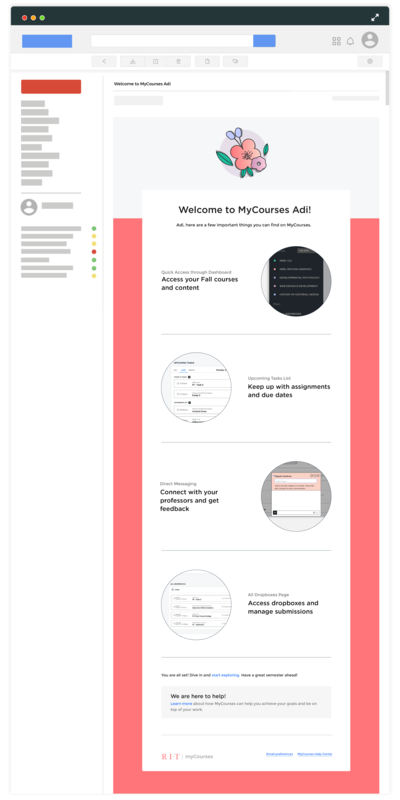 myCourses is a course management platform that allows RIT students to access course content, manage assignments, and interact with peers and professors. This redesign focuses on creating an academic tool that encourages an environment that better motivates students and aims at making a students life better. What do the users currently feel about MyCourses? I started with evaluating the existing site structure and interaction flows, and conducting a competitive analysis. In addition, a user survey was conducted of the two user groups: students and faculty. After the survey, a group of students were interviewed to better understand their usage and the issues they face using myCourses. Students frequently use only 3 out of the 12 features offered by myCourses. They are not fully aware of the various features available, partly because their professors don't use those features. 60% of surveyed students and 40% of faculty do not use the messaging system offered by myCourses. Students requested the addition of a system that allows them to contact faculty and set-up office hours appointment. Accessing course content and assignment submission is inefficient. 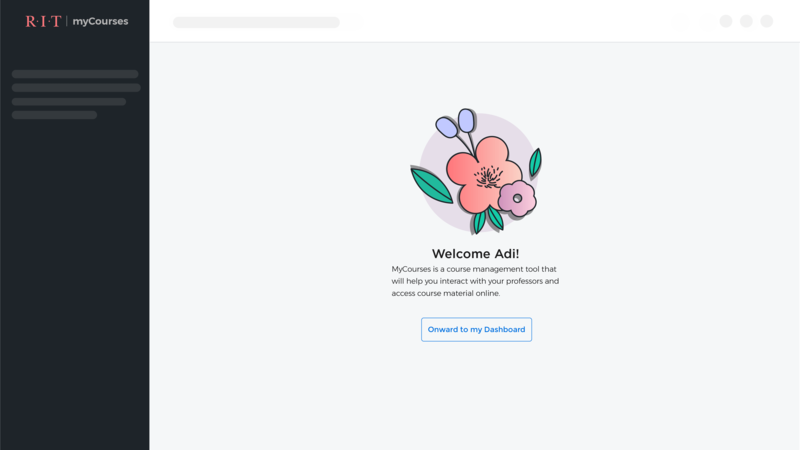 Students complaint that they have to scroll down to access their courses, and the organization of course content makes it hard to find information. A significant number of complaints came not from the site structure itself, but the failure of faculty to update and organise content and put up due dates in the calendar and dropbox. As a course management tool myCourses should provide students with the information they need with as little friction as possible. But students engage with this academic tool every day, so it should do more than just inform. 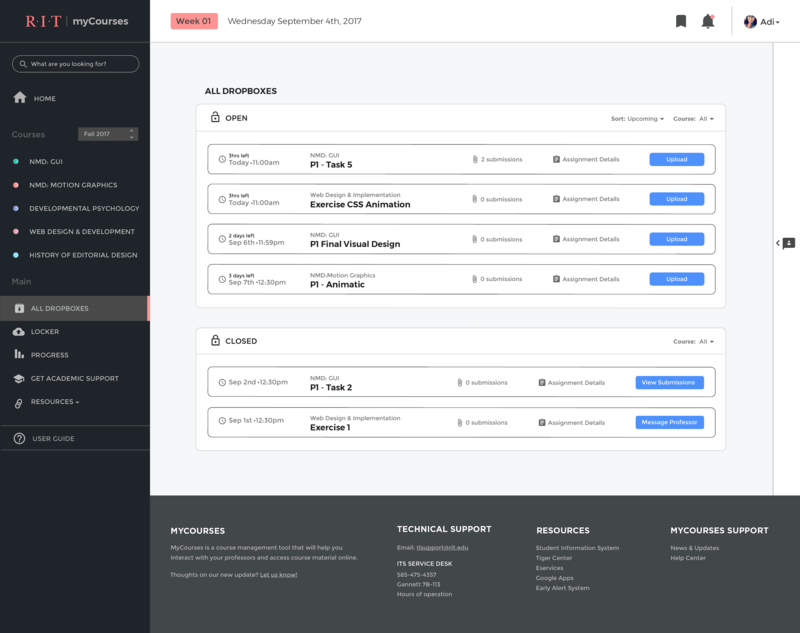 This redesign is built on the idea that myCourses should act as a companion. Along with giving students the support and information they need during each semester, it will help them progress in their classes and aid their mental well being. Welcome new students to the website and make them comfortable with the new experience. 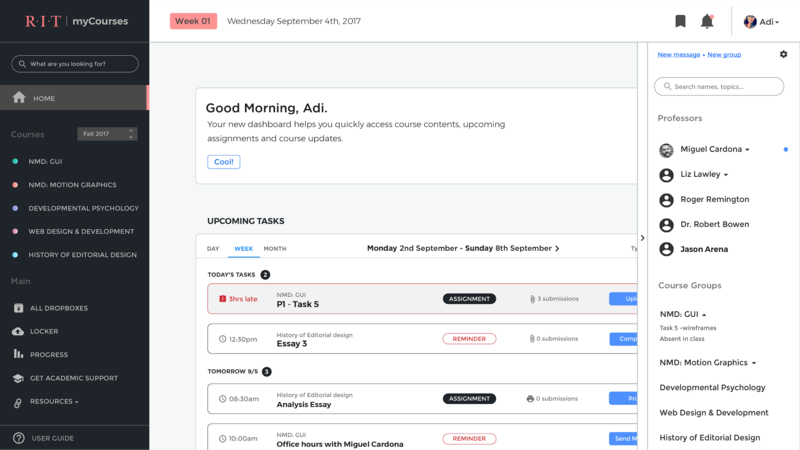 Along with making students aware of the features myCourses offers and how they can use those to improve their workflow and productivity. myCourses welcomes students and makes them comfortable with the new experience. 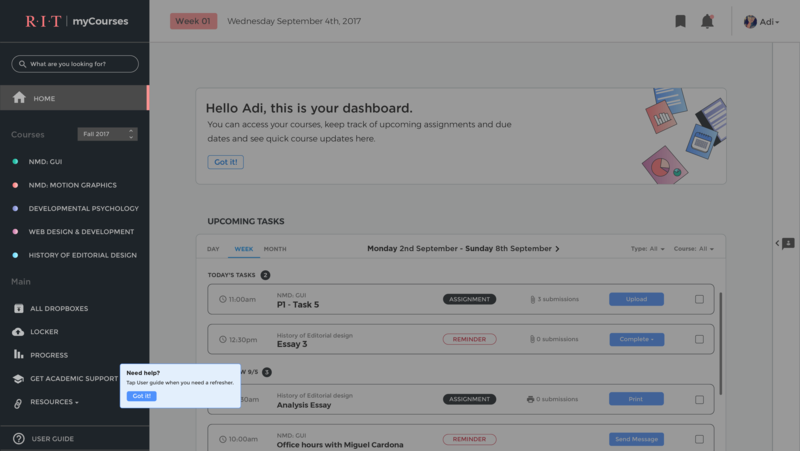 It briefly tells them what myCourses is about and then asks them to go onward to their dashboard. 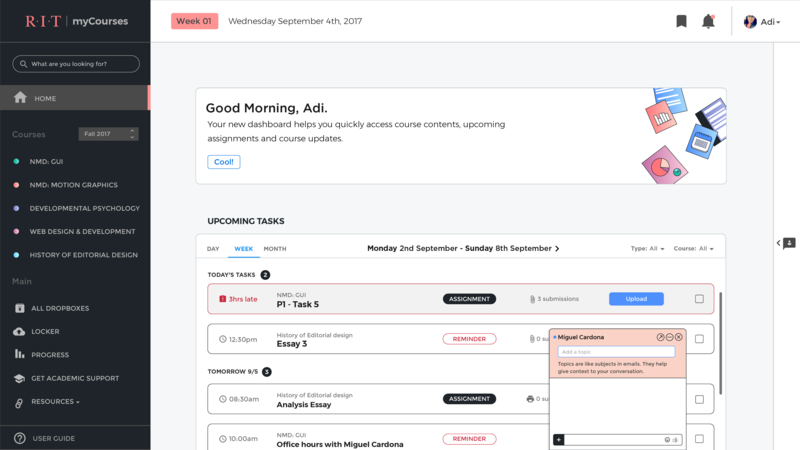 Students receive a quick, short email that informs them about the major features of myCourses, such as access to course content, task list, chat system and dropboxes. 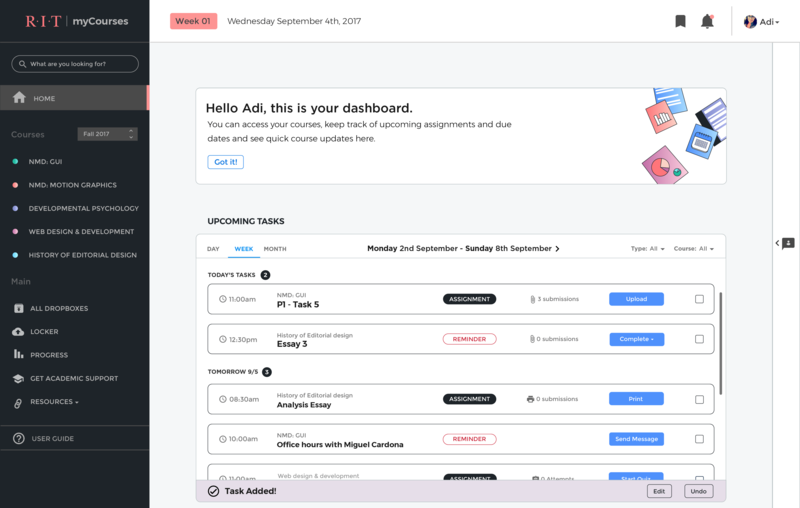 Students get personalized dashboard messages on the homepage. These range from messages that help students schedule appointments with their professors to just giving them recognition after a stressful week. 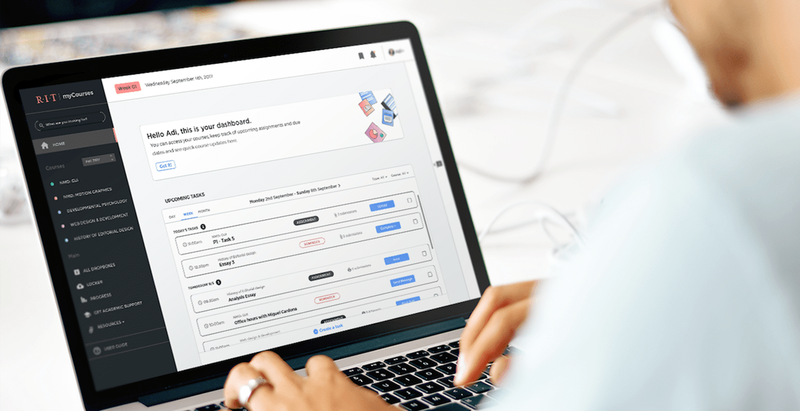 For the first 10 days, myCourses will familiarize students with the basic functions it offers such as course content, course updates, task list, and user guide. Tips will pop up during users' sessions at contextually relevant moments. For the rest of the semester myCourses will gently nudge students in form of these tips to improve their work flow and time management. Learn more about what myCourses offers through this handy user guide. 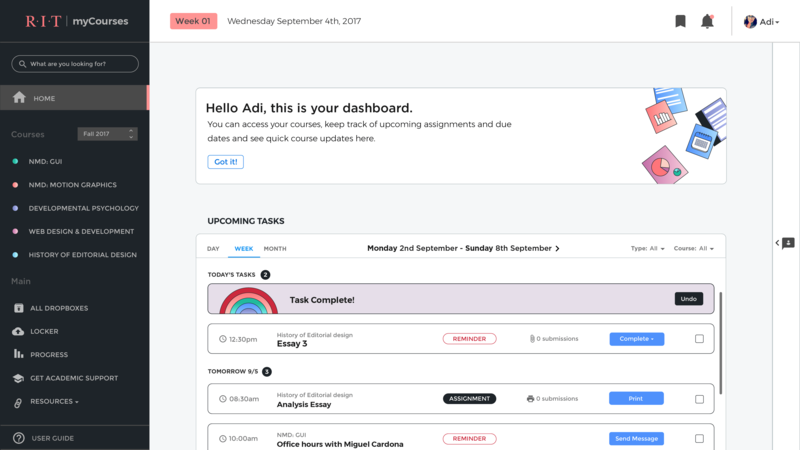 Making it easier for students to track their upcoming assignments and deadlines, while ensuring they are rewarded for their hard work and progress. 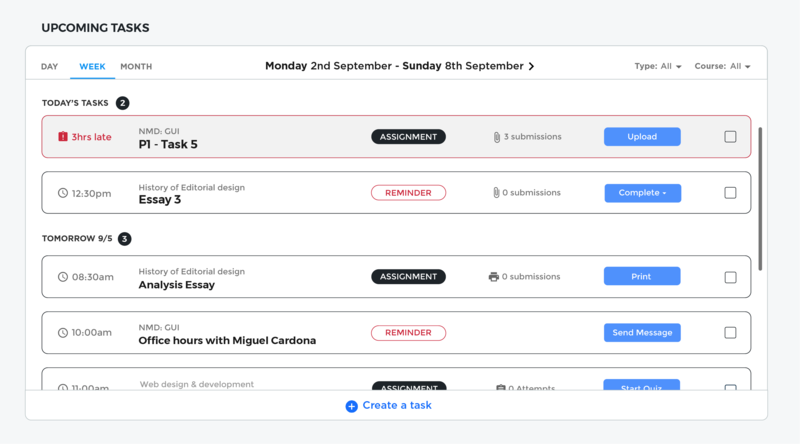 The redesign introduces a dedicated task list and re-imagined the assignment submission system. 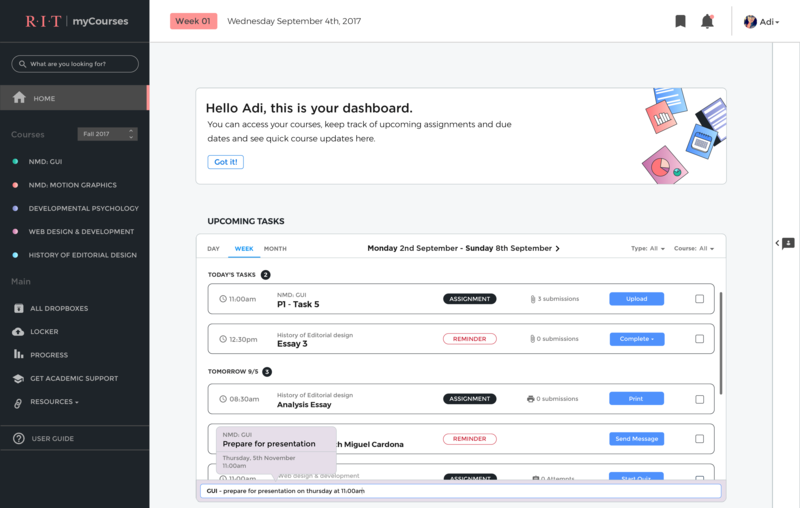 A dedicated task list at the top of the homepage helps students keep track of upcoming assignments and course updates, increasing their productivity and organization. 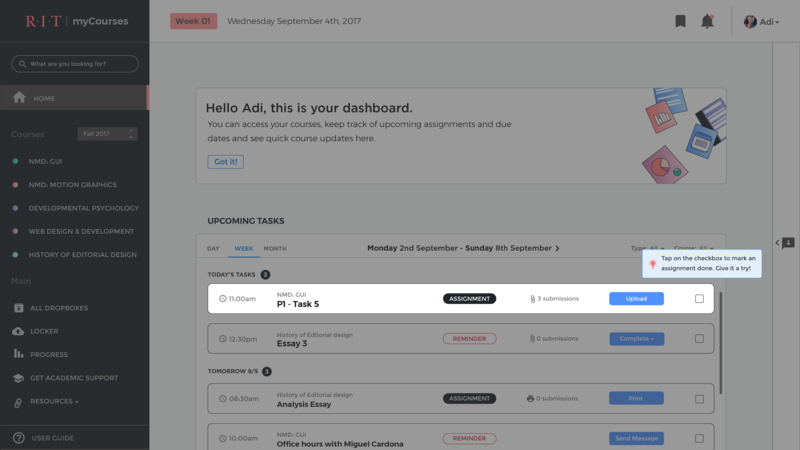 Students can upload assignments directly from the task list for efficient submissions. They can also check off completed tasks, add custom tasks or reorder existing tasks based on priority. Smart dropbox creates a dropbox for each assignment the faculty uploads, eliminating the need for faculty to input the same information twice - once for the assignment and then for the connected dropbox. This removes the issue of missed or incorrectly named dropboxes. Students can find these assignments/dropboxes on the 'All Dropboxes' page. The Dropbox Submission Modal is accessible through the task list, homepage and course page. It enables easy access to assignment-specific dropboxes. 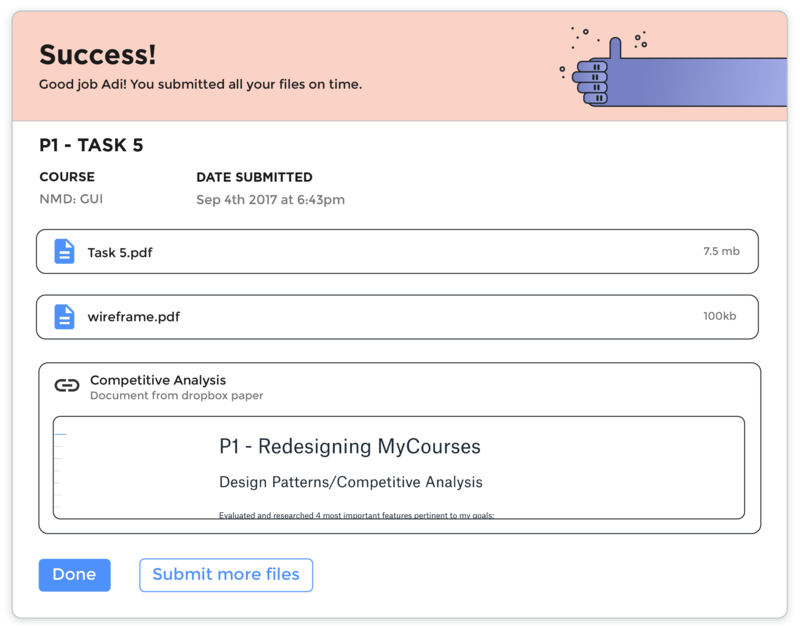 Students can see assignment details and past submissions, drag and drop files or upload through their google drive or myCourses locker. What if they don't have a file? They can submit text or a link as well. 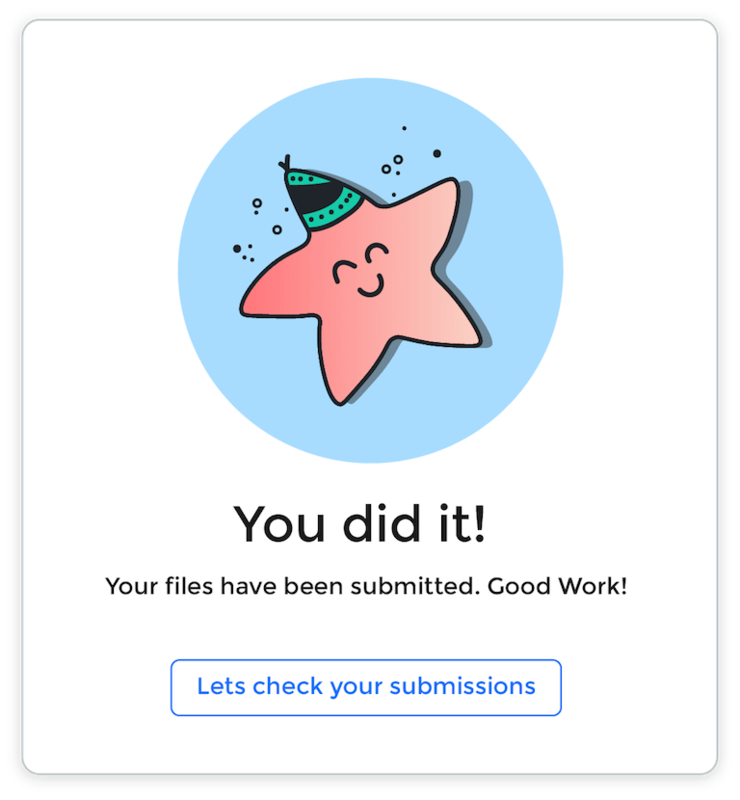 On submitting files on time, students get a summary of their submissions to review along with a message congratulating them for submitting their assignment on time. When students submit an assignment with higher grade weightage on time, they get a more rewarding message. 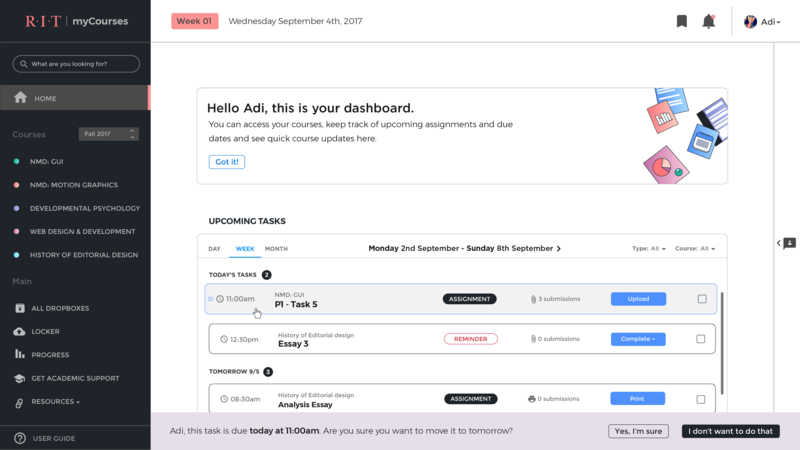 With the use of relevant copy, illustrations and features such as custom reminders and progress reports, myCourses can help get students back on track. 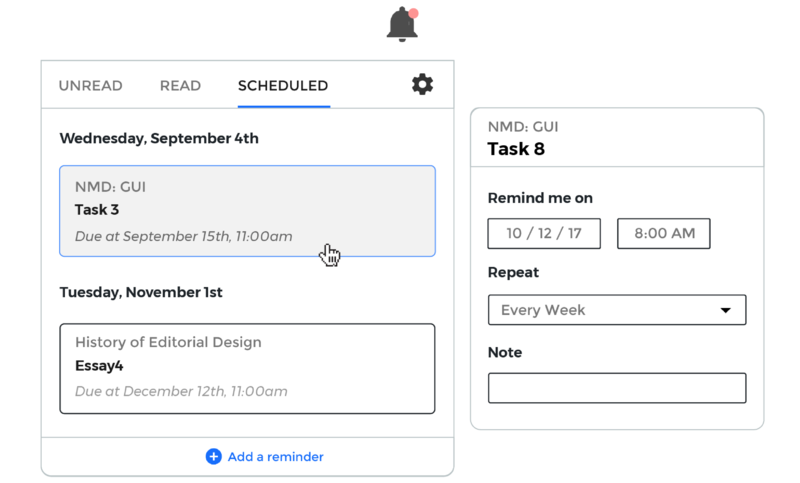 Overdue tasks will be marked in red, with a different icon in the task list. If a student submits an assignment late, the dropbox summary message will change accordingly. Students will also get an option to contact their professors. 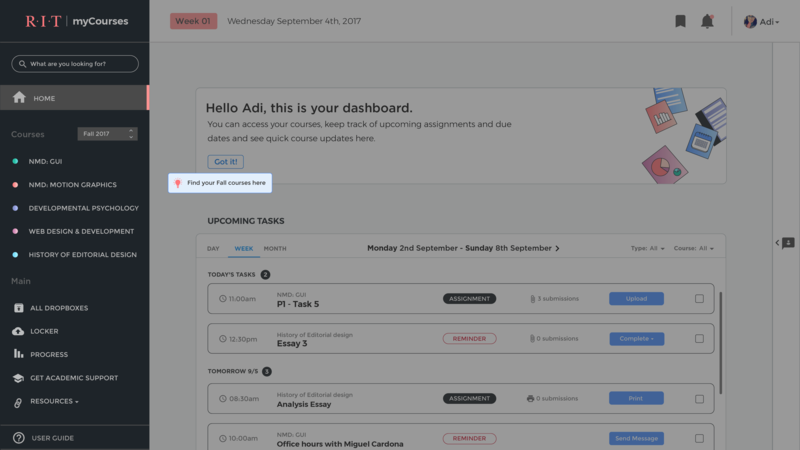 Students can set up custom reminders for assignments in myCourses, such as an essay due at the end of the semester. 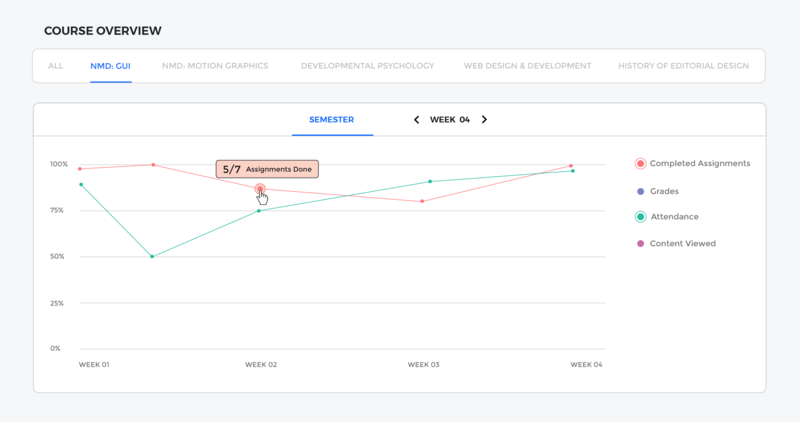 Students can check their progress through the semester and make sure they are on track. Highlights tells the student what courses they are doing well in and what courses they need support with. There was a need to create a support system that facilitates easier and faster communication between faculty and students. 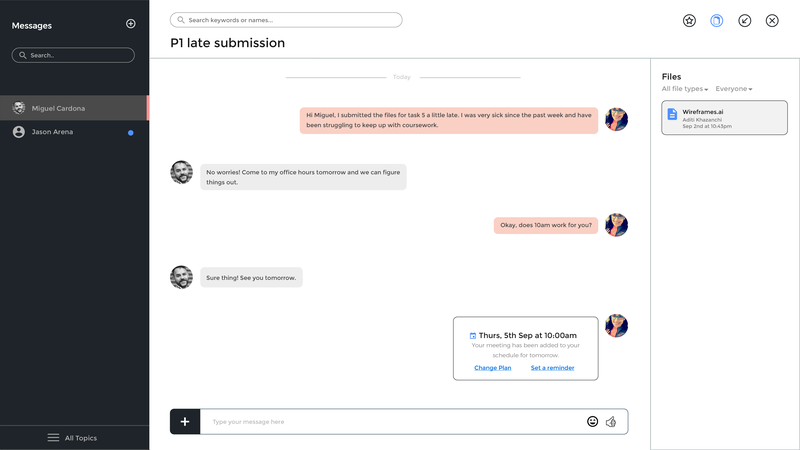 Students can contact their professors or peers through the built-in chat system in myCourses. 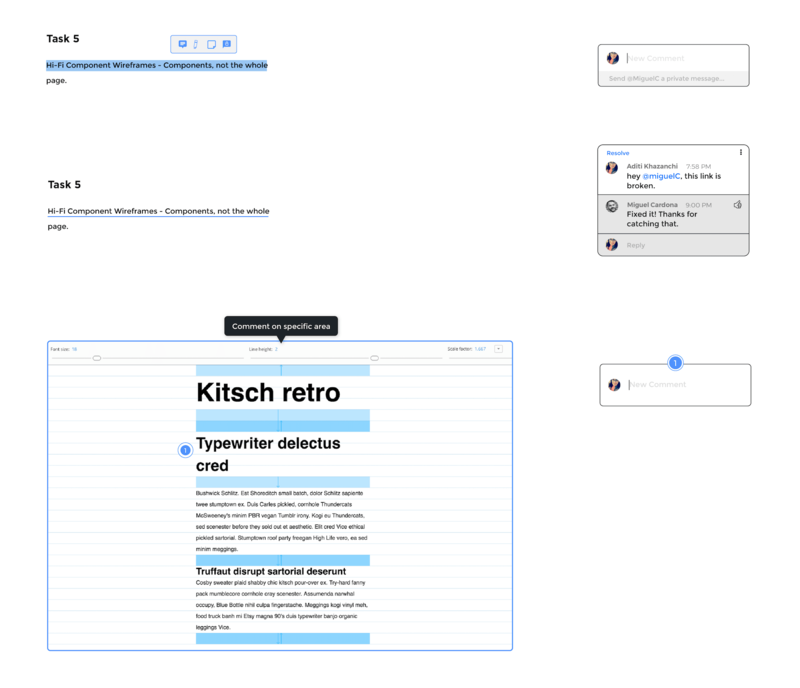 They can mark important messages from their professors with a star, find that one important file the professor sent, and even give a topic to each conversation. Topics are just like subjects in emails and help give easy context to the conversations. 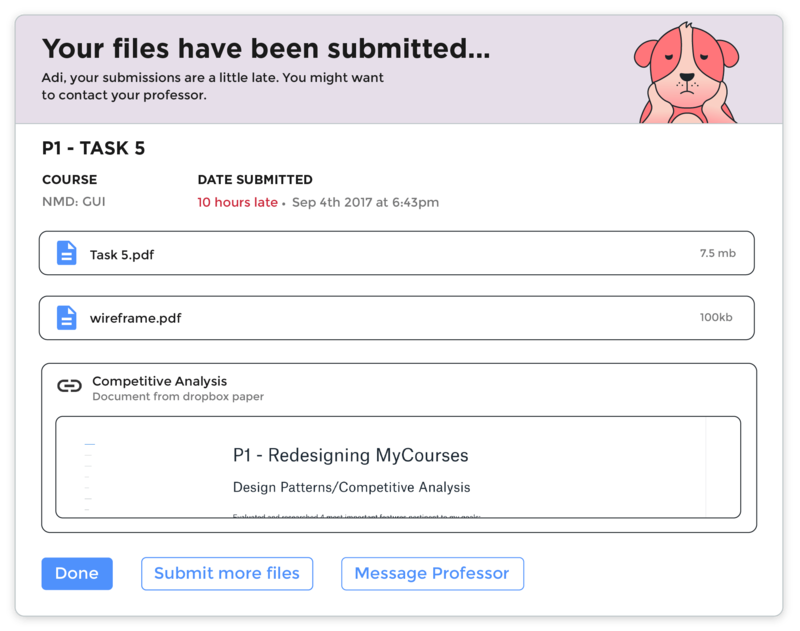 Students can comment on any content put up by the professor in real-time, asking questions or keeping professors accountable for updating content. They can even select and comment on specific areas of an image. Relevant and timely notifications are key to get people on a schedule. Of the surveyed students, 40% of surveyed students spent 5 - 30 minutes per visit on myCourses. When students are away from myCourses, they can choose to get a daily activity summary outlining the recent updates and upcoming deadlines. Students get an email notification reminding them that they have a due date in 15 minutes with no submissions made yet. 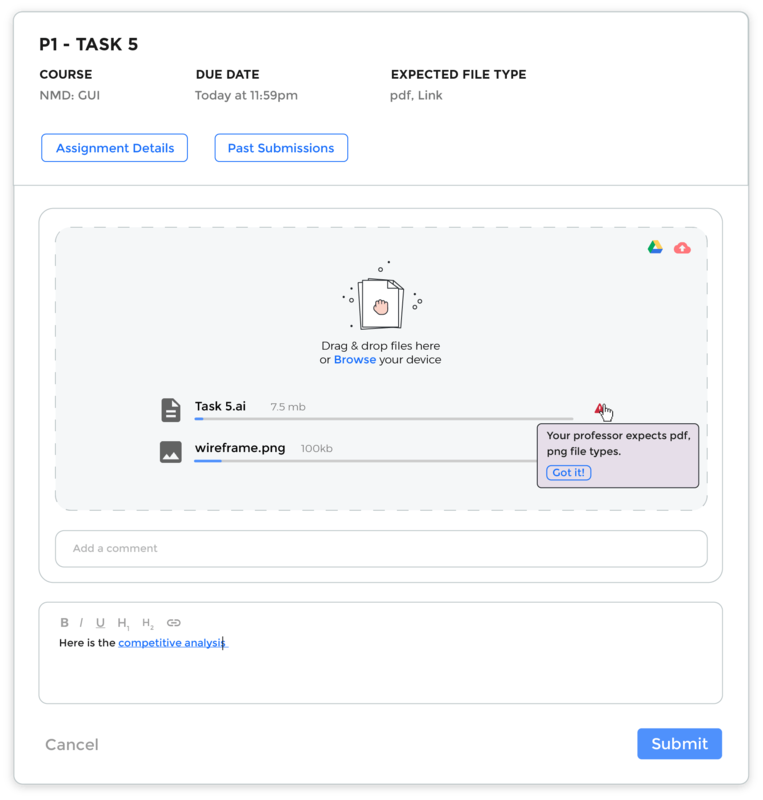 This interaction explores how the student can quickly submit a link to dropbox from their mobile before the deadlines passes. It was incredibly rewarding to take on a problem and create a solution for an application that my classmates and professors now use every day. 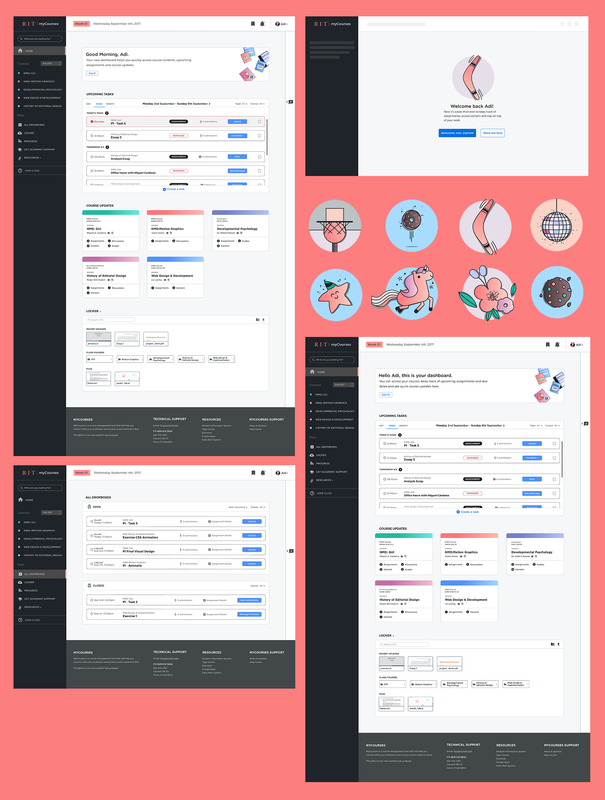 Redesigning myCourses pushed me to create a whole design system from start to end: an ongoing onboarding experience, several core pages and a mobile interaction. I would like to envision a better end of semester experience for students once they have successfully finished all of their assignments for the term. I'd also like to explore how myCourses could better help the students’ academic standing, if they’re not able to finish the semester on a positive note.